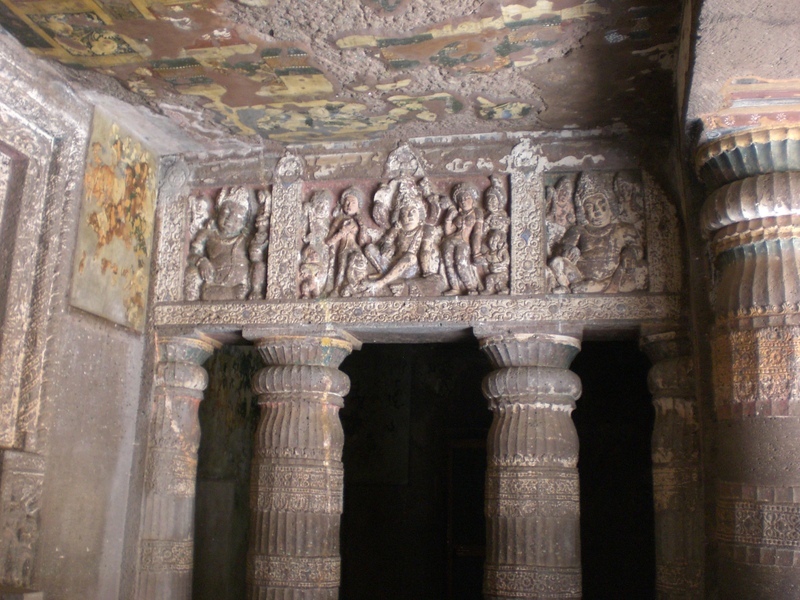 Above: Peering into a dark empty chamber in one of the caves at Ajanta, an amazing site of ancient Jain, Buddhist and Hindu art in India. If I had titled this post AFTER writing it, maybe it would have been easier to do. Continuing the thread from last month (new moon this month in Aquarius, Mardi Gras and Chinese New Year is this coming Tuesday, and of course there’s St. Valentine’s Day on Thursday), we are at a point of lunar emptiness. At this juncture, my heart and emotional body feel somewhat tentative, in a state of formation not quite clear yet full of potential energy. The mind still has its agendas, set during the ruckus of last month and all its insistence on planning for “a new year.” And the belly/gut, having recently finished dinner, has a comfortable feeling of fulness. What I’d like to explore this evening is the necessity of emptiness–mentally, emotionally and physically–to better appreciate completion/fulfillment/resolution. All around us now are extremes: ultra marathons, kickass workouts, groaning buffets offering all you can eat. There is apparently a perception that time and energy will run out unless we give our all ALL the time. If we accept that this moment is irreplaceable and unique, we are bound to acknowledge its passing whether or not we are mindful of it and whether or not we are meeting it with our energies at full bore. But consider, if you do practice yoga and pranayama, the difference in the quality of your practice in the morning, after bladder and bowels have been emptied, and in the evening, after the events of the day with their concomitant emotional responses, as WELL as two or three meals, are within you. True emptiness is rare–only fasting from food, thought and emotion might bring us to the brink of what yoga philosophers called “kaivalya” or ultimate liberation. Today, opinions on everything–from yoga, to exercise, to solving economic problems–are so polarized that finding a middle way sometimes seems impossibly out of reach. Yet this being, the one animating these fingers from the thoughts in this brain and the feelings in this heart, yearns for harmony–the sure knowledge that things are as they should be, though they may not be as my ego wishes them to be. Gazing at my morning pranayama candle’s lambent glow in the living room, hearing the plangent strains of the harmonium, feeling a sensitive yet hearty embrace from a friend, I get closer to an understanding of the interplay of full and empty. The difference between the silence before harmonium sounds and voices chant the Bhagavan mantra and the silence after, the difference between the way I feel now and how I will feel when the spring cleanse is over (a mono diet of khichadee for a few days) both give a sense of the preciousness of what the drstra (knower) can perceive. As I watch the watcher, the moon will wax, become full, and finally fade away, whether clouds obscure its light or not. In witnessing its filling and emptying I see a mirror of my “koshas” and how they can be stuffed full of food, thoughts, emotions, judgments, memories, experiences of all kinds. Keeping an integrated balance in the midst of the dance of opposite energies that form our world requires practice. In his new book, The Core of the Yoga Sutras, B.K.S. Iyengar writes that through developing a discriminating mind (viveka khyatih–II.26), we come to the point in our lives where this interplay will not pull us off balance. Tatah dvandhvah anabighatah–(II.48). Through practice, we can become our own anchors in stormy times. A good day of practice, a mediocre day of practice, no matter–we are human and the gunas will shift and we will experience variations in quality. The great elements around us, the possibility of refining viveka khyater to the point of non attachment to results of our efforts in the dance of these elements aims us in the direction of the final samadhi of the fourth chapter of the Yoga Sutras. Finally, the practicing yogi can experience dharmamegha samadhi, when the raincloud of virtue showers down upon us. But more on this theme next month. Perhaps more about the caves, too. One can involuntarily tap into the powerful conspiracy of connectedness swirling around us–indeed a vortex–by simply inviting, allowing, and accepting emptiness into our very core. Your beautiful post reminds me of the importance of pause and reflection.